Square Dancing has a rich and varied history. 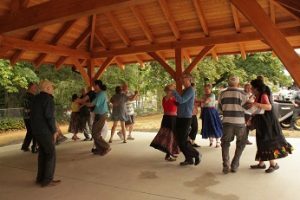 Four years ago when Peter, our caller, was engaged by Vancouver Island’s two Summer festivals, to call a square dance at each, he envisioned having a top notch band to back him up, and to provide outstanding enjoyment for the dancers. With this goal in mind, he called friends, who had the talent and would enjoy getting together to provide the old time music which was needed, and which we all love.We all got together, first in Courtney, at the Vancouver Island Music Fest, and a week later at the Island Folk Fest, thoroughly enjoyed both, and began hosting monthly square dances at at The Hub in Cowichan Station. The band was called The Shady Grove Dance Band. After four years, in the Spring of 2018, 3 members of the original band left for various other commitments, and Peter asked three others to help establish the revised band. As of September 7,2018, when dances move to Cobble Hill Community Hall, The Reorganized Shady Grove Dance Band,which provides live music for our dances consists of Luann Burton, bass; Eric Deslaurier, fiddle; Manny Fritsch, mandolin; Kim Firth , banjo; Steve Heizer, guitar; Eric Oscar, fiddle and concertina and Peter Sussman, Caller. Dances are held at 7:30 on September 7th, and the first Friday of each month except July and August at the Cobble Hill Community Hall,3550 Watson Avenue.